An interactive love letter to an American icon. 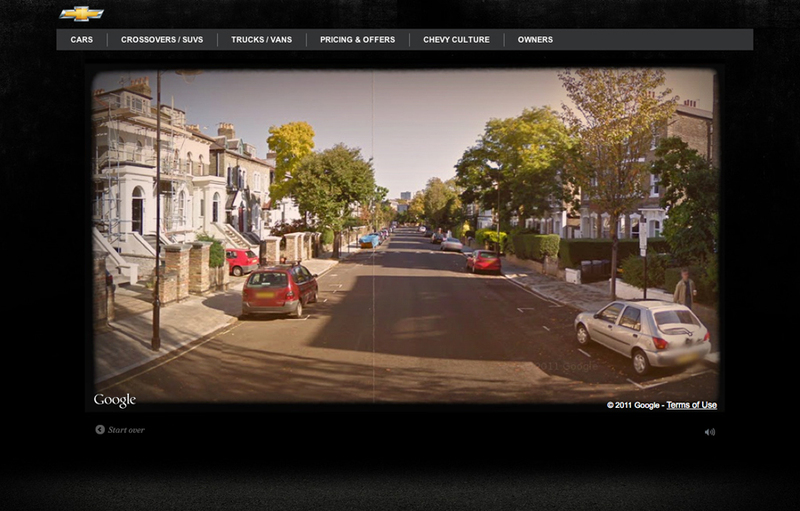 We created a site that let users take a nostalgic drive through their past. Jumping into one of six Chevrolet cars like the 57’ Bel-air, ’69 Stingray or the Camero which were all shot exclusively for the campaign. How did we do it? Using Facebook connect we identify locations from the users profile and then use Google Street-view to generate stop-frame drive past video. The campaign also pulls in Facebook friends and displays them throughout the experience which is the first of it’s kind. Users can takeaway a map showing their life journey which they can easily share on Facebook or with the friends featured in their ride. All of the cars were shot on location in Detroit and then a bi-coastal b roll shoot linked the experience together, the linking shots are chosen from country, suburban or urban to keep the narrative of the campaign. We’re also using Google Street-view data to it’s full capacity by utilizing the standard street-view player and having Flash control the animation.